Goddess Pratyangira devi is came from the third eye of Lord Shiva and she is symbolizes in the form of lion and human. 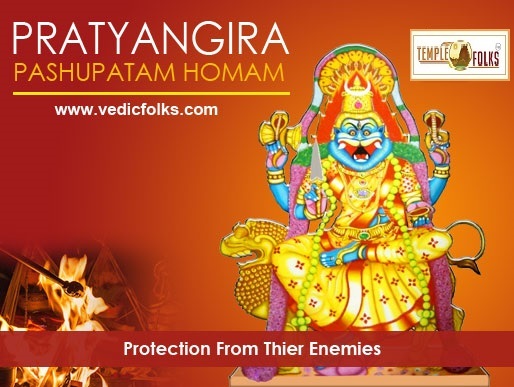 Pratyangira Devi homam is very beneficial for an individual those who wants to get complete relief from any sorts of negative effects and evil forces influences in life. Goddess Pratyangira devi homam is well suitable homam for those who facing dreads from their foes / enemies which leads to various troubles. Indeed Pratyangira devi helps her devotee?s to stay away from any negative or bad effects to have a peace of mind to lead a trouble free life. Pratyangira devi homam help to completes one's desires in wider extent without any obstruction caused by negative forces. Performing this homam fulfils all needs of an individual by avoiding conflicts and other problems. Helps to get rectified from legal issues. Pratyangira Homam plays a vital role in reducing risks related to success to ahead a victorious life. Well suited homam for managing bad forces to have a peaceful life. 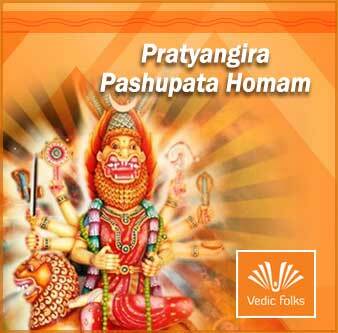 To get all the bounties and experience the enormous integrity of Pratyangira Homam (fire customs or lab), you can get the assistance of our accomplished Vedic Purohits (intellectuals) at Vedicfolks.com on the web.